I would like to apologize for any inconvenience resulting from the manner of communication provided by our Customer Service agents. As the fastest growing travel company in the world, we sometimes fall short of our goal, however we are constantly looking to improve that is why this forum is great for both positive feedback and areas where can improve.r. I am happy that you were contacted by our General Manager who resolved the situation and you were happy with your vacation. The reason why we have over 3.6 Million Facebook Likes, more customer video reviews and sent over 100,000 people on vacation this year alone, is because we are the worldwide leader in promotional packages - that's our specialty. On here you will read 5 star reviews. (I encourage you to do your research and read real-time reviews) for the sake of your upcoming trip. Ishould have really listened. 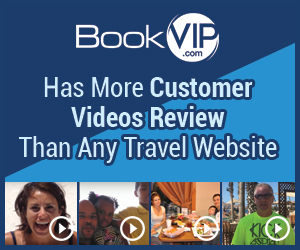 For those of you who are traveling and looking for discounts and deals on a trip and your interested in BookVip.This is a VERY risky idea. I learned the hard way. After reading multiple and extensive reviews on negatives. I foolishly still booked with them. (Because I thought this is too good to pass up.) So let me tell you my very current and recent experience. 3 months before my trip I actually purchased a trip with BookVip. After the rep told me how great it was, how awesome it is, after confirmed availability. They charged my card for over $300. This included 4days and 3nights in Miami. I was satisfied with my purchase. UNTIL I called the hotel 2 weeks prior my stay that they supposedly had booked for me. Hotel confirmed multiple times that they don't bsee my reservation. I then called BookVip back after being on hold with the reservations Dept for about 45min. They told me I'm sorry they are unavailable. I pressed my case on how BookVip charged my card and even sent me a receipt. I told them why didn't they call me and tell me my room was unavailable...the just kept apologizing over and over and over..but wouldn't issue an refund. They kept telling me it can be credited for another trip. (IF I TILD YOU FIRE IS HOT AND IT WILL BURN YOU, WOULD YOU BELIEVE ME??? )....BookVip is that fire...and if you use thier services you are at extremely risk of an unexpected un-garunteed trip. If you read bad reviews..(BELIEVE THEM)..
Review #1287979 is a subjective opinion of ZestyOwl.